Today French chateaus are much sought-after locations for wedding receptions and celebrations. They offer the most perfect, romantic setting in which to exchange your promises of eternal love. This dreamy French inspired photoshoot was styled by Sam Lloyd, The Wedding Owl. 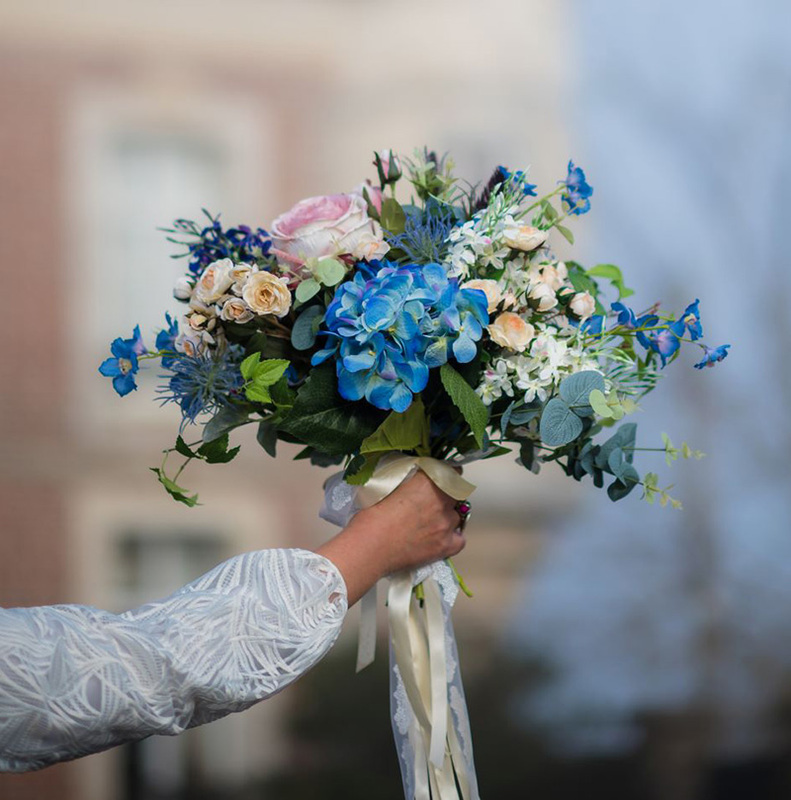 To create the style, Sam worked with a talented and inspiring group of Kent based wedding suppliers that included the wonderful husband-and-wife duo Fleur Challis Photography. We certainly think, that after you have looked at the Chateau de Dohem, it will be, “love at first sight” ,or as we say in France “Le coup de foudre!”. Sam said, “The inspiration for the shoot came from the Chateau de Dohem itself, as often it is the setting that plays a major role in shaping the look and feel of a couple’s wedding day. I’m secretly passionate about French Chateaus. I’ve been in love with them since pulling together my first scrap books. For me they are insanely romantic, and the Chateau de Dohem is certainly that, delivering that wow factor in confetti- bucket fulls. I therefore wanted to capture not only the inherent elegance, but also the love, hard work and dedication that Wendy and Marcus the new owners, who are recently married themselves, have put into lavishly restoring their stunning turreted-beauty, in Northern France. The team were up early on the day of the shoot, on the Euro Tunnel and at the Chateau De Dohem in Normandy (just a short journey by car from the coast), before Wendy and Marcus even had time to put the coffee on. We were fortunate, as the shoot took place on a gorgeous atmospheric, (all be it chilly) magical and misty morning, during the ongoing renovation works. Under the watchful lens of the @Channel4 film crew, who were on site filming for Escape to the chateau: DIY, we had to work around the very patient builders and electricians working on the renovations. During a very narrow window of opportunity, the team created two different and inspirational styles, for couples planning on getting married at the renovated Chateau”. Dinning alfresco. In a classic French wedding style, the first tablescape is set up in front of the beautiful facade of the renovated chateau, within its high-walled, private garden. Against the beautiful natural stone backdrop, crisp white linen, luxurious pops of gold, and crinkled slate-blue gingham table runners, adorned with rustic faux French lavender flower pots, give the styling a nod towards the French Countryside that surrounds the Chateau, creating a formal but relaxing vibe. Rustic French barn. For the second of the styled tablescapes, the team persuaded the English building and renovation crew to down their tools and take time out of their hectic schedule. Working around the scaffold towers and dangling electrical cables, the team managed to create a rich, elegant, opulent, masquerade-style dining experience in the converted barn, where intimate wedding blessings and wedding receptions (up to 50 guests) will take place. The opulent blue velvet, with accents of gold and hand written, precious calligraphy stationery, French seals and other curated details were off set with atmospheric flickering candles. Sam continued,“With a very small window of opportunity to get into the barn, and get the perfect shots, and with the workmen’s gear piled up at the back of us, this made this shoot one of my most memorable and fun so far. I hope with so many tiny details coming together so beautifully, it will inspire couples to book this totally stunning Chateau De Dohem”. If like us, you fall in love with the Chateau De Dohem for your wedding, contact Wendy and don’t forget to watch out for Escape to the Chateau sometime in Spring 2019!